Steve Jobs Stanford University Inspirational Speech - Motivate Amaze Be GREAT: The Motivation and Inspiration for Self-Improvement you need! In 2005, the late Steve Jobs made an awesome speech to graduating students at Stanford University. This speech is regarded as one of the greatest commencement speeches ever. Steve gave advice to students about life, talking about his own trials and tribulations, giving some tips and timeless quotes about how to succeed. This is a huge testimony from someone who achieved a lot providing a first hand take on his own thoughts and conclusions about his success.
" I had no idea what I wanted to do with my life and no idea how college was going to help me figure it out"
"So I decided to drop out and trust that it would all work out OK. It was pretty scary at the time, but looking back it was one of the best decisions I ever made." "...much of what I stumbled into by following my curiosity and intuition turned out to be priceless later on"
"Because I had dropped out and didn't have to take the normal classes, I decided to take a calligraphy class..."
"I learned about serif and san serif typefaces, about varying the amount of space between different letter combinations, about what makes great typography great." "None of this had even a hope of any practical application in my life." "But ten years later, when we were designing the first Macintosh computer, it all came back to me. And we designed it all into the Mac. It was the first computer with beautiful typography." "If I had never dropped in on that single course in college, the Mac would have never had multiple typefaces or proportionally spaced fonts." "If I had never dropped out, I would have never dropped in on this calligraphy class, and personal computers might not have the wonderful typography that they do." "...you can't connect the dots looking forward; you can only connect them looking backwards. So you have to trust that the dots will somehow connect in your future." "You have to trust in something — your gut, destiny, life, karma, whatever"
"This approach has never let me down, and it has made all the difference in my life." The meaning behind Steve Job's inspirational speech: What you're doing right now can be crucial to you in the future. 1 year from now, 10 years from now, 20 years from now, who knows? You can't make the connection now and predict like Steve Jobs told us. What you can do is acknowledge that, what you are doing now will be very important in the future. So...you should do things that you really like in a really good way and trust your instincts, because if you do so, in the future, they can turn out to be very useful! You have to believe and trust what you're doing, even if it's something crazy like "dropping out of college" like Steve Jobs did or doing something that the majority will disagree. You simply have to trust yourself and your deepest thoughts in order to get to a better place, that's a major step in order to reach your dreams and goals. Believe, make the best you can do in the present, so that the dots will connect for a greater future. "I was lucky — I found what I loved to do early in life." "I had just turned 30, and then I got fired. How can you get fired from a company you started?" "What had been the focus of my entire adult life was gone, and it was devastating." "I really didn't know what to do for a few months. I felt that I had let the previous generation of entrepreneurs down"
"I was a very public failure..."
"But something slowly began to dawn on me — I still loved what I did." "I had been rejected, but I was still in love. And so I decided to start over." "I didn't see it then, but it turned out that getting fired from Apple was the best thing that could have ever happened to me..."
"It freed me to enter one of the most creative periods of my life." "I started a company named NeXT, another company named Pixar, and fell in love with an amazing woman who would become my wife." "In a remarkable turn of events, Apple bought NeXT, I returned to Apple, and the technology we developed at NeXT is at the heart of Apple's current renaissance." "I'm convinced that the only thing that kept me going was that I loved what I did." "You've got to find what you love." "If you haven't found it yet, keep looking. Don't settle. As with all matters of the heart, you'll know when you find it." The meaning behind Steve Job's inspirational speech: Follow Steve Jobs advice and find your love in life! Don't expect to get lucky like him...it's not a matter or luck, search for it, only stop when you find it. Why? Because if you found the work that you love and if you love what you do, you'll be able to persist when others give up, you'll able to raise again and again no matter how hard the fall is. Love will get you through all the difficulties the road for success has for you. Endure with it, become better and sharper as time goes by. 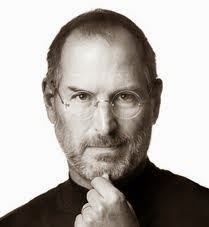 The Steve Jobs that founded Apple was not the same Steve Jobs that went back to Apple after founding Next and Pixar. The ups and downs of life made him wiser and much more strategic. Yet the hiatus he took without making part of Apple and having nothing to hold on to, made him dig deep down in his gut searching for answers. Love was the answer, the answer that took him to be the most creative Steve Jobs ever. So when things get hard, don't get discouraged, see the value in everything, remember why you do it in the first place and don't stop creating, do what you love regardless. Great results will arrive, no doubt about it. "...for the past 33 years, I have looked in the mirror every morning and asked myself: "If today were the last day of my life, would I want to do what I am about to do today?" And whenever the answer has been "No" for too many days in a row, I know I need to change something." "....external expectations, all pride, all fear of embarrassment or failure - these things just fall away in the face of death, leaving only what is truly important." "No one wants to die. Even people who want to go to heaven don't want to die to get there. And yet death is the destination we all share." "Right now the new is you, but someday not too long from now, you will gradually become the old and be cleared away." "...have the courage to follow your heart and intuition. They somehow already know what you truly want to become. Everything else is secondary." The meaning behind Steve Job's inspirational speech: This is dramatic because we all now know Steve died because of this cancer, but nevertheless what he says in this "story about death" its major, don't get it twisted. When you put all in perspective, like you are about to die, your true wishes and desires come forward and nothing else matters. What's hard here is that we don't put ourselves in this place everyday and every time we just think about it sometime. But that's not the advice Steve Jobs gives, we should think about this all time because ultimately what we do today is a brick, a brick that will be part of a wall, and we'll call that wall our life. What kind of wall are we building? Something that stands the test of time and will be helpful to others? Or is a it a weak wall that will fall with the slowest breeze? You have to take control of your life, and that begins with having control of your own time. Your time is a valuable asset, use it well and wisely. 50 Inspirational Steve Jobs Quotes and One More Thing!